Have you decided to build an outdoor pickleball court for your recreation center, school, or club, but don’t know where to begin to set up a pickleball court? If you have ever built a tennis court, then you have won part of the battle as the techniques for constructing pickleball courts are practically identical to those used for tennis. Whether you coach pickleball for league play at a recreation center, a country club, senior living community or a school team, the following guide will help you understand the basics of constructing a pickleball court. Will you be converting a tennis or badminton court to play pickleball? Are you building a multi-court complex? Are you starting a new pickleball court from scratch? Whatever your situation, it’s important to keep in mind the standard size of pickleball courts, and then adjust according to your unique program needs. For example, if you need to use a tennis court to play pickleball, it can be easily divided into four pickleball courts so multiple games can occur simultaneously. Or, if you are building a multi-court pickleball system, the overall construction and dimensions would be the same as a single court. The only difference is that you will be building multiple courts on a larger scale, and will need fences with padding between each pickleball court. Pickleball Playing Area:30 by 60 feet is the standard when converting a tennis court, but 34 by 64 feet is preferable for tournament play or if you will have a standalone pickleball court. Concrete: This type of outdoor court surface is the best in terms of both durability and value. Asphalt: This can be a good option if you want to go a more affordable route, but it can require additional upkeep. Snap-Together Plastic: Snap-together court surfaces can be applied over asphalt or concrete which can be helpful when you don’t want to permanently alter the surface of a multi-use court. Fencing is crucial for multi-court pickleball as it contains the ball within the playing area and provides security for players as well as spectators. There are a variety of different types of pickleball court fencing to choose from, but fences made from wire are the most common as they allow players and spectators to see into and out of the court. They also allow light to pass through easily. A contractor who is familiar with building pickleball courts can help you choose and install pickleball fencing. 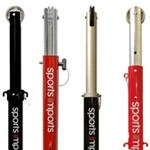 Just be sure it is covered with rust-resistant materials to keep players safe from injury. Pickleball Fencing Dimensions: 10 feet high is preferred, but 4 feet can also work as long as the top of the fence is padded. Lighting for pickleball courts follows a fairly standard protocol. All pickleball courts should include a two 1,500 watt light poles. 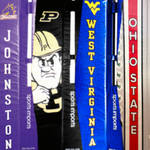 You will want to ensure that each pole is 18 to 20 feet high and mounted in the center, at least 24 inches back from the court. Sleeves (may or may not be required). Hire a professional contractor. While installing a pickleball net system may be a simple process if you’re placing a net and painting the surface for just one court for your own yard, hiring a professional contractor can help ensure everything is built and set up to code for recreation centers, clubs, and school pickleball play. Orient your court north-south.Outdoor pickleball courts are exposed to mainly environmental elements that can obstruct players’ vision (position of the sun, shadows cast onto surface of court, etc), so it’s important to orient your pickleball court north-south. Baselines: These run parallel to the pickleball net on both ends of the court. Sidelines: These run perpendicular to the pickleball net on both sides of the court. Non-Volley Line: These lines should be 7 feet from the net and located on each side of the net between sidelines, running parallel to the net. 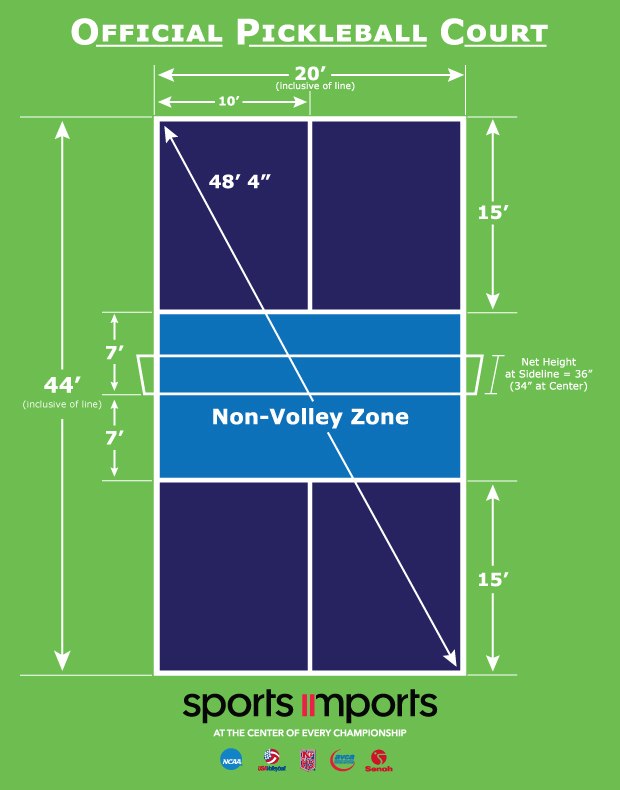 Non-Volley Zones: These are areas of the pickleball court surrounded by two sidelines, the non-volley line, and the net. Centerlines: Located on each side of the net running between the non-volley line and baseline. 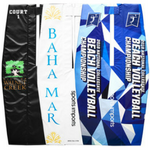 Service Courts: Run on either side of the centerline, surrounded by non-volley line, sideline, and baseline. *If you are painting the surface of your court or marker lines, let the paint dry for 24 hours before placing your net system. Follow pickleball court layout guidelines from the USAPickleball Association to ensure that everything is set up according to regulation pickleball standards. Are you ready to get started? Find a sales rep who can help you choose the best pickleball net system for your program. ©SportsImportsVB and sportsimports.com, 2017. Unauthorized use and/or duplication of this material without express and written permission from this site’s author and/or owner is strictly prohibited. Excerpts and links may be used, provided that full and clear credit is given to Sports Imports and sportsimports.com with appropriate and specific direction to the original content.